The time for action against oil trains is now! On Saturday, July 11, SoCal 350 Climate Action and its regional partners rallied at L.A.’s Union Station and held a teach-in in front of Olvera Street, calling for an end to bringing exploding bomb trains loaded with tar sands and other volatile crude oils into our communities. Read about it and check out the photos! More than 5,000 people participated in 100 events during 2015’s #StopOilTrains Week of Action — the largest protest against oil trains in history. In L.A., almost 200 people showed up at Union Station to make their voice heard. Photo By Jack Eidt. July 11th – Los Angeles: Stop Oil Trains Day of Action! As Los Angeles endeavors to improve the quality of life for its citizens, making the city safer, more livable, with a more sustainable vision of our future and our Los Angeles River, danger rides the rails into our city. We Stand in Solidarity: Despite dozens of fiery disasters, the oil industry continues to dramatically expand oil train transport in California and into Los Angeles. This month is the second anniversary of the tragic Lac-Mégantic, Quebec, when an unattended 74-car freight train carrying volatile fracked oil from the Bakken region of North Dakota rolled downhill and derailed, resulting in multiple-car-explosions and a fire that that killed 47 people and destroyed more than 30 buildings in the town center, and all but three of the 39 buildings in the downtown had to be demolished due to petroleum contamination. Join us as we stand with residents in Lac-Mégantic and communities across North America to say NO to oil trains. Why Rally? Oil trains, carrying crude by rail, including volatile and toxic tar sands crude from Alberta, Canada, will be rolling into Southern California, down tracks that cross the San Fernando Valley, following their L.A. River adjacent route on their way to the refineries in Wilmington. These trains have become known as “bomb trains” due to their explosive and destructive track record. We don’t need to add volatile oil to the mix, given regular accidents between freight rail and our own Metrolink trains (2008 in Chatsworth). As a city pursuing its clean energy, renewably-powered future, the City of Los Angeles must take a stand against putting its citizens, communities, businesses and infrastructure at unnecessary risk in order to aid in the continued production of some of the most climate-damaging fossil fuels. The Mar Vista Community Council last month approved a resolution calling for the city to act. If the Phillips 66 Santa Maria Refinery Crude By Rail expansion is approved, Los Angeles will see an increase of “bomb trains” shipping volatile crude through the city and down the LA River. What? As Los Angeles’ participation in the Stop Oil Trains Week of Action, the event will offer Los Angeles Councilmember José Huizar the opportunity to be the star player in a colorful, attention-getting, media-friendly public action and press conference focused on oil trains threat to communities in Los Angeles. This will initiate a week in which we offer the public more information on the oil trains and the risks that they pose, the proposed opposition motion, and other ways the community and its leaders can work together to help stop the Phillips 66 Santa Maria Refinery crude by rail expansion. Why Union Station? The iconic home and symbol of trains in Los Angeles since 1939, Union Station is the largest railroad passenger terminal in the Western United States. Instantly recognized locally and around the world, it is ideal for our oil trains action, providing the perfect backdrop for electronic and social media visuals. Even though oil trains won’t be coming directly to Union Station, they will be coming through the heart of Los Angeles. Delivering our message at this legendary location draws maximum attention focused on L.A. trains. The added value is Union Station’s role as transportation hub allowing all participants the opportunity to use public transportation to get to and from the event, with all Los Angeles area light rail and Metro rail, as well as bus lines with routes and service to the downtown train station. No more exploding trains! No more tar sands! No more Russian Roulette with our communities and climate! Multinational oil company Phillips 66 is proposing to expand its San Luis Obispo County refinery to receive oil trains carrying explosive, toxic, and carbon-intensive tar sands oil. If approved, more of these oil trains will begin rolling through California’s communities, threatening schools, homes, community centers, and parks. 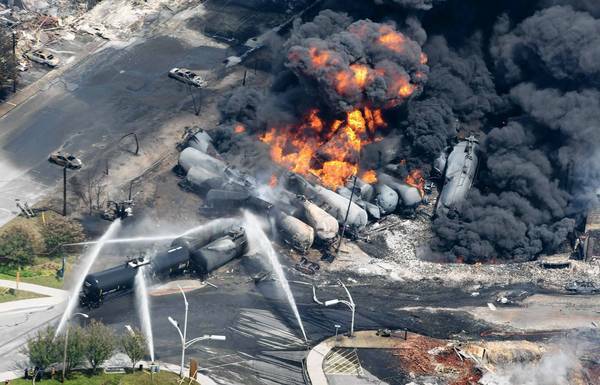 Over 5 million California residents live in the oil train blast zone.